I was recently briefed by the MySpace team prior to the re-launch of the brand. I had worked closely with the MySpace team back in 2006-2007 and was intrigued to see what’s new with the platform and what value the new platform can provide for brands. June 12th marked the official re-launch of MySpace.com. You may have seen the comprehensive media blitz tied to driving acquisition of new and nostalgic users. This is definitely not your old MySpace. Gone are rainbow unicorns and other elements that made MySpace what it was in its heyday. 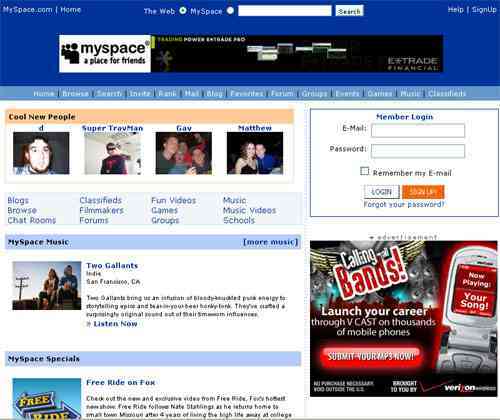 MySpace currently has a user base of 20 million that is primarily 18-29 years of age. The re-launch will focus on positioning itself as the alternative destination for the 18-34 set. One of the key goals is to add enough value with the experience to attract the 29-34 set to increase the affluent user base. The focus on a highly visual user experience (horizontal scroll vs. vertical) that is grounded in music, editorial & curated content and an advertising light/contextual ad experience was redesigned from the ground up with the goal of increasing the current base of users. One of the key areas of strength for the platform is the focus on music. From high profile investors such as Justin Timberlake to the 52,000,000 songs free for consumers, MySpace is laser focused on connecting fans with artists and extending those connections through the re-launch. When I asked the MySpace team to describe the new platform compared to existing platforms the team said that it is part Spotify, part Pandora and a little bit of Pinterest. It was interesting that Facebook was not directly mentioned and after reviewing the platform I can see why. The key terms that were repeated by the team were tied to affinity, discoverability and connection with the key symbol of the platform being the infinity symbol. At its core Facebook is a story telling and amplification platform built on individual connections. 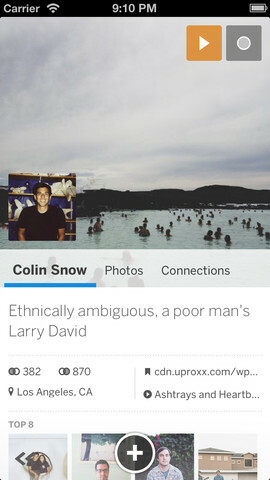 MySpace, similar to Pinterest, is focused on discoverability and affinity. A subtle difference, but a difference nonetheless. One of the main areas of focus with the new experience is tied to Discovery. From the pervasive bottom navigation to the traditional discover tab, “discover” is front and center for the user. When a user clicks into this section the MySpace team will feature editorial & trending curated content. This is also going to be a key area of aligning with brands via contextual advertising vs. traditional paid units. More on that in the amplification section. Another key point of discovery tied to the platform is the visually appealing search functionality. Clear text ques and hashtag support is another element to drive discoverability of people, content & brands. With the launch MySpace has also redesigned its iOS app to offer users the chance to upload animated GIFs and stream “social radio,”. This again is to further enable connection and discoverbility of artists & content. A number of my questions were focused on how brands can get the most out of the platform. I asked questions tied to content penetration, ability to support promotion, and opportunities tied to hyper local targeting. One of the core areas of focus was tied to a brands ability to drive reach & engagement on the platform. I did not get definitive numbers such as those tied to Facebook and EdgeRank. The responses ranged from we will continue to refine the content that is presented as we continue to scale, so this will definitely be an area to focus on as more brands work to connect with users. Brands with a close association to music & musical artists can find the platform to be a key element to consider in terms of driving sponsorship or activation. From contextual playlists to the ability to connect an artists performance on a show like Jimmy Kimmel that then kicks over to a exclusive live stream on MySpace, there are many opportunities to connect brands beyond the walls of MySpace to create more integrated engagements. The platform also supports more traditional promotions that can tie into retail activations similar to the Bud Light example below into more comprehensive user engagements such as the 50 shows 50 states 1 day activation from Bud Light. Promotions are deep linkable so cross platform and traditional digital units can support awareness of activations. For brands that require age gating, the Bud Light example also showcases how this is handled in order to present content to those of legal age. One of the other key attributes to the platform is the ability to drive purchase directly through the platform. This is where a Pinterest comparison comes into play. By enabling e-commerce through the experience the goal is to directly impact revenue for those organizations that choose to leverage the commerce and royalties functionality. When it comes to content and the importance of visibility of owned messages, I asked a series of questions tied to amplification capabilities of the platform. The following is the breakdown of key points of the discussion. Owned Post Amplification – It appears that organic post level amplification to increase reach on an individual piece of content is not a current option at launch it is not out of the realm of possibility for the future. Advertising – The ad types will vary depending on how the user interacts with the platform. There will be ads tied to the streaming service which may morph into a subscription type service to be ad free. Log In Ad/Welcome Tray – Brands will have an opportunity to “own” the prime spot of log in prior to the user moving through their feed. This unit looks like a highlighted content unit and is built to look like a contextual placement vs. a traditional ad. This spot is owned by the brand for the day and will initially be available to all users. I did ask about targeting moving forward and that will more than likely be an option in future updates. In Stream Ads – Brands will also have the option to position contextual ads in the horizontal stream of users. No additional details were shared beyond the fact that this option exists. Discover Ad – This comes in the form of a contextual ad unit that could be as simple as a playlist that leads into a branded experience. The key again is to leverage the brands association with relevant and contextual content to maximize opportunities for engagement. 2) Inferences based on Affinity – The final element, similar to Twitter’s focus on the Interest graph is MySpace’s own ability to target based on users affinity signals. Brand Messaging Capability – One of the key differences between MySpace & Facebook in terms of brands interacting with users is tied to the ability of brands to send messages to users via the MySpace mail & message service. Extensibility – One of the other key elements is for elements of MySpace, such as the MySpace music player to extend to other networks, for example it is possible to live stream an event via an API onto Facebook if there is a goal to drive engagement with sponsored content cross platform. One of the areas I was most excited to see is tied to what MySpace calls the Infinity Score. One of the big missing elements associated with the native Facebook platform is the ability to dive deeper into social & topical relevance of users. With the upcoming launch, it is possible for bands & brands to see who their “top fans”. Top fans are people who have interacted the most with an artist or brands content. Top Fans are then granted exclusive access or available to activate against. The key for a user to become a “top fan” is directly tied to factors such as impact of shareability through their network, interaction with the content (e.g. music listens) and other factors that MySpace did not fully reveal. This level of visualization also incents users to continue to engage to maintain their position with this very passive gamification/engagement layer. It will be very interesting to watch what happens post launch. Some of my questions were tied to considerations around rebranding vs. keeping the MySpace name. One thing is for sure. Most web users definitely have an opinion about MySpace. With the alignment with Specific Media there are definitely opportunities for MySpace to provide value for the right brand.